Had the movie stayed at the Life offices, had it stuck to its initial burst of creativity and subtle character moments The Secret Life of Walter Mitty would be a marvelous underdog, but halfway through, when Mitty decides to track down the reclusive photographer whose photo he can’t find, the fantasies stop, and the Secret Life becomes the real life. Granted the second half is very gorgeous, with Stiller in picturesque Iceland and even not-so-picturesque Greenland and really lovely Afghanistan, but the imagination and sense of wonder yields to perfunctory writing. The characters Mitty meets aren’t very interesting, and the romantic subplot offers nothing innovative. The only relief is the occasional check-up from Todd at eHarmony (though it does have a great payoff), but the contributions of Wiig and Scott are noticeably missed. Even the mystery of the photo can be deduced in only a handful of minutes after its revealed as a plot point. 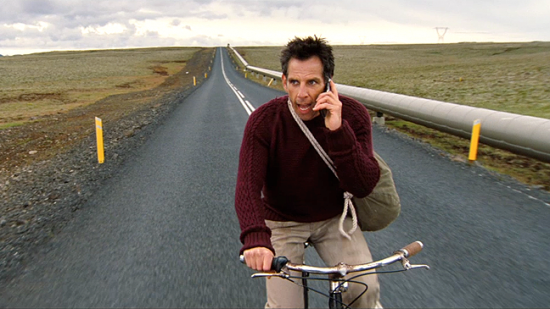 But Walter Mitty is not a bad movie; actually, it’s a pretty good one. And while the nicer, simpler pleasures are extinguished early on, the movie maintains a warm glow; I only wish Walter Mitty could have a few more secrets.